You'll be £19.99 closer to your next £10.00 credit when you purchase The Forgotten VCs. What's this? Fought amid the most challenging terrain of any theatre during the Second World War, the campaign in the Far East saw heroic actions against the unyielding Japanese that resulted in the awarding of more than forty Victoria Crosses – greater than a fifth of all the VCs of the war. Such actions include that of Major Frank Blaker, whose battalion of the Gurkha Rifles was held up by Japanese machine-guns on 9 July 1944. After climbing for five hours up a 2,100-foot hill, Blaker crawled on his hands and knees through dense jungle alone until he was close enough to stand up and charge the strong enemy position. Though mortally wounded, he urged his men to follow and the hilltop was taken. During the famous Chindit operations, Lieutenant George Cairns was with the South Staffordshire Regiment as it attacked a Japanese position on top of ‘Pagoda Hill’. The Chindits reached the summit and, charging into the Japanese, a vicious hand-to-hand battle ensued. In the fighting a Japanese officer hacked off Cairns left arm but, astonishingly, the young Londoner then killed the enemy officer, picked up the sword with his right hand and carried on fighting. He died the next day. The Gurkhas are renowned for their courage and it is unsurprising that many of the Fourteenth Army’s VCs were won by these tough Nepalese soldiers. Rifleman Bhanbhagta Gurung found his battalion of the 2nd Gurkha Rifles pinned down by an enemy sniper. So he stood up in the open and killed the Japanese soldier. As his battalion advanced again, it once more came under enemy fire. Bhanbhagta Gurung charged the enemy positions, taking five Japanese fox-holes, one by one in the face of almost point-blank fire. The wide-ranging nature of the conflict in the Far East saw awards being granted for actions not just in Burma but also in India, Hong Kong, Singapore, Malaya, Borneo, New Guinea and even off the coast of Japan itself. The recipients came from across the Commonwealth, including Australia, Canada, Fiji, Great Britain, India and Nepal. 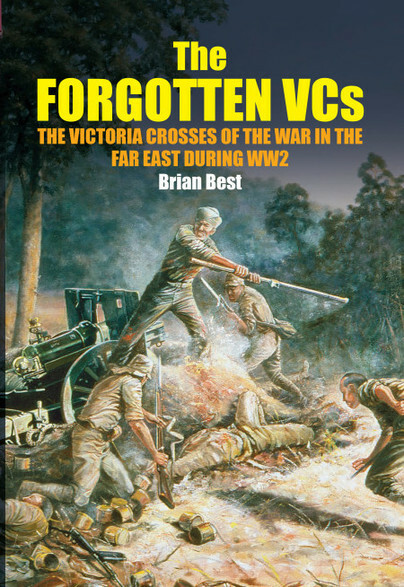 These VC actions are told in great detail in The Forgotten VCs, the first book to examine in depth the Victoria Crosses of the war in the Far East. Brian Best brings to life the daring deeds of a group of courageous men in the most inhospitable of battlefield conditions, filling a glaring gap in the historiography of Britain’s most prestigious award for valour. The author is to be saluted for filling a void in the history of the Britain’s highest award for valor by spotlighting the exciting exploits of brave men – many of whom made the ultimate sacrifice. Two more volumes from a dedicated author who is to be congratulated on his ongoing research and publications relating to our highest military award of gallantry. The use if the word “Forgotten” in the title of a history book raises the hackles of many a historian as it is usually not the case. This latest title from Brian Best, who specializes in books on the Victoria Cross, can claim some mitigation as many of the awards covered in this volume are of the “Forgotten Army” – Bill Slim’s 14th Army in Burma. This is a jolly good read describing some long-forgotten actions and the principal participants in the events that are still within living memory. Recommended. Brian Best has an honours degree in South African History and is a Fellow of the Royal Geographical Society. He was the founder of the Victoria Cross Society 2002 and edits its Journal. He also lectures about the Victoria Cross and war art. He is married and lives in Rutland.